The National PTA has recognized Marshall Academy of the Arts as a National PTA School of Excellence for building effective family-school partnerships. Only 124 schools were chosen nationwide, and Marshall is the only school in California to earn the award this year. The National PTA School of Excellence program started in 2013 to help strengthen family-school partnerships and make measurable progress in the areas of education, health and safety, and arts and cultural exploration. Through the program, a PTA partners with its school to examine how families feel the school measures up to the research-based indicators of the National Standards for Family-School Partnerships. After evaluating their current family engagement strategies, the PTA and school then work together throughout the year to find new ways for families to support student success. The award is given when families feel the school has achieved a high level of engagement or when the PTA and school have made substantive improvement in families’ perceptions since the beginning of the year. Long Beach’s Longfellow Elementary School earned the honor last year. Marshall celebrated the award at its recent Back to School Night, with food trucks and families mingling around an outdoor stage. Newly assigned principal Marie Hatwan commended last year’s principal, Michael Navia, last year’s PTA president, Erica Dawson (who applied for the award), and Marshall’s teachers, staff, parents and students. PTA AWARD – Marshall Academy of the Arts earned the National PTA School of Excellence Award. 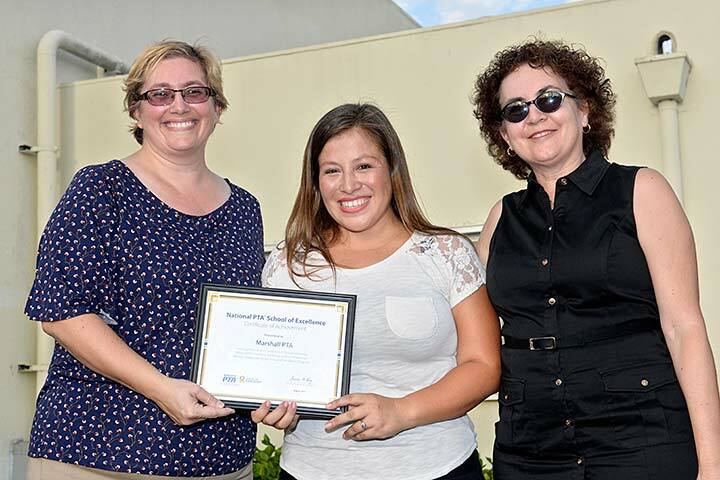 Celebrating at Marshall are the school's 2014-15 PTA President Erica Dawson, current PTA President Angie Diaz and Board of Education Member Diana Craighead.